There are a number of ADHD treatments available today, including medications. Some parents, however, may prefer to find additional non-drug therapies for their children who have ADHD. Such treatments may improve the overall outcomes when used alongside medication. In a recent study, it was found that when children with ADHD received a very intensive training program using computers, they experienced relief from ADHD symptoms. The results showed that the children showed improvement in the most common symptoms of ADHD. They also experienced better working memory and attention, along with enhanced planning and organisational skills. The computer software helps to restore a key deficiency seen in the working memory of people who suffer from ADHD. Working memory is important for keeping hold of information long enough for a person to reach a goal. It is not necessarily a major goal but simply the goal to complete basic tasks each day. You can’t, for instance, make a phone call, if you can’t remember the number long enough that you can actually enter it into the phone. You can see how working memory is so vital to functioning on a daily basis, and is especially critical for children to achieve success in school. It helps us to quickly recall the just learned information we need to take action on even the simplest of tasks each day. 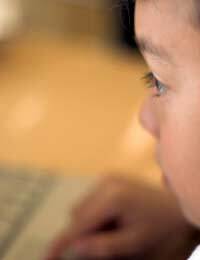 In the study, children used the software under the supervision of a parent and the researchers conducting the study. The software included a set of twenty-five exercises that each child had to finish over the course of approximately five to six weeks. The sessions lasted around half an hour to forty minutes and the exercises were given in a game format on the computer. With the format being that of a game, the children all enjoyed the software. The benefit is that they had fun while the algorithm inside the software continued to make the exercises harder as the children progressed through it. This way, the children were always being challenged. Both the parents and teachers of the students took part in an assessment of the symptoms of the ADHD children. This was done before the software was used and also one month following the software ‘treatment’. Four months later, a final assessment was performed. The overall consensus was that the symptoms had significantly improved in the ADHD children. Researchers do caution that despite the positive results, the software will not replace medication therapies, including those that use stimulants. They cite that the computer software is an excellent add-on to medications, which can help children to better manage their ADHD symptoms, particularly where a medication is not enough to keep things under control. For children with ADHD, medication continues to play an important role. But since it will not necessarily relieve all ADHD symptoms, finding complementary therapies remains critical to giving these children the best chances of success in life. This new study offers hope for such supportive ADHD treatments. @FG. We'll certainly consider that at some point. Thanks for the suggestion.